"Warrior Four Eight One, if you haven't already, contact Boston Center on one three four point seven and have a good day," Lebanon tower signed off as we climbed among the mountains into a gray sky. I had carefully reviewed the obstacle departure procedures, but did not need them. Conditions were still VFR and despite being a gloomy, unappealing sort of VFR, they were nonetheless adequate to see and avoid any so-called "cumulogranite". We ended our week stay at the Curtis Hollow Farm in Vermont that morning and returned to the Lebanon Municipal Airport. We moved our departure time earlier than originally planned in response to a revised forecast for thunderstorms mid-afternoon. On the ramp, I discovered that the line crew at Granite Air Center had not tied down Warrior 481 after they moved her to parking. I contemplated the ferocious storm that pummeled our rental home to the west, knocking out the power. The storm had likely passed through Lebanon on its way east and I was grateful to find my airplane undamaged. Leaving the airplane unsecured to the ramp struck me as rather poor service for the $15/night parking fee Lebanon charged. Though I did not say anything to the staff, it is my understanding that Granny let them have it after we departed. With the airplane re-packed and pre-flighted, we said our goodbyes to family and returned to the sky for the next leg of our vacation. Rather than return west to New York, we turned eastbound toward the coast to visit Alex, an old friend from high school whom I had not seen in over twenty years. It would be my second trip to Maine and a first for Kristy and The Bear. Along the way, we passed over Lake Winnipesaukee and Laconia, familiar sights from many trips to New Hampshire over the years. We also logged a few minutes in the clouds as the ceiling lowered to our cruise altitude. I requested a lower altitude from Portland approach to remain clear of clouds as the rocky coast of Maine came into view. Dense, but isolated, rain shafts were scattered around our position. Our destination, Brunswick Executive (the former Brunswick Naval Air Station), had a new automated weather reporting system that required keying the microphone twice in order to trigger a broadcast (an AWOS-A). I assume this is a power saving feature versus the typical AWOS/ASOS units that broadcast continuously. It was the first time I had encountered one of these and I was glad that I read the NOTAM explaining its operation. Nonetheless, the synthesized voice broadcast by the unit was difficult to understand until we were within approximately 15 miles of Brunswick. 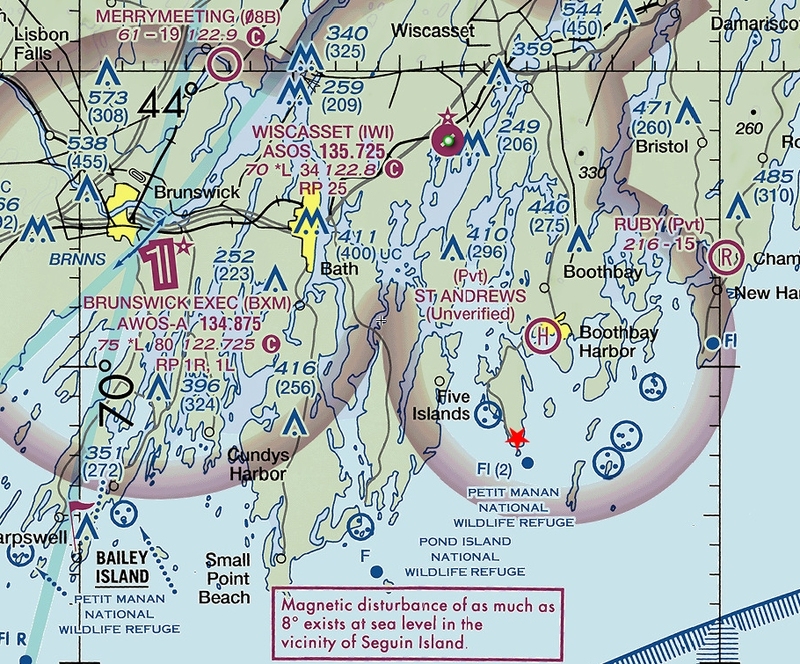 We emerged from the region of scattered showers surrounding Portland and cancelled IFR in the air once we were able to decipher the automated weather observation broadcast and had Brunswick in sight. On descent into Brunswick, we flew along the Androscoggin River (above). The 8,000 foot long parallel runways (the narrower of them, 1L / 19R is now closed) of the former Naval Air Station came into view. We crossed over the top of the field and entered a right pattern for 1R. From above, the facility comprised acres of largely deserted concrete adjacent to the runway. I imagined that the ramp once teemed with military aircraft, but the handful of GA aircraft parked at FlightLevel Aviation on the north end looked rather lonely situated on that vast wasteland of non-movement area. While my trusty ground crew (i.e., Kristy) helped bundle up the Warrior, the line staff at FlightLevel Aviation brought our rental car, a late model Nissan Altima, directly to the airplane for baggage transfer. As intended, we arrived well before any storm activity in Maine and, this time, I tied down the Warrior myself before we departed the airport. In the rental car, I accessed driving directions to the hotel from the Google app on my iPhone and received an unpleasant surprise; Google predicted a one hour drive time. How is that possible? I had booked our lodging from Vermont once we confirmed the trip to Maine with Alex. Many of the cookie cutter chain hotels in Brunswick were quite expensive, but I found a great rate at the Newagen Seaside Inn on Southport Island. Reviewers of the inn rated it with universal acclaim. Expedia indicated that it was 15 miles from Brunswick, which was farther away than I wanted to be, but not unreasonable. So I booked it. Inn is indicated by a small red star on the southern tip of Southport Island. As we sat gaping at the iPhone, we realized that Expedia's 15 miles must have been an "as the crow flies" distance and had no bearing on actual driving distance. In the well-gridded Midwest, such a straight line distance might have been a reasonable first approximation to driving distance, but not here on the rocky coast of Maine. It was a facepalm moment, but a lesson learned and an opportunity to explore more of the area (see how I spun this into a positive?). We followed US-1 from Brunswick through Bath and Wiscasset, passing the long line of people waiting at Red's Eats for what are reputedly the best lobster rolls in Maine, then followed the serpentine Route 27 past Boothbay Harbor to the remote tip of Southport Island. The Newagen Seaside Inn has been in operation since 1816, though a World War II era fire led to its reconstruction in 1943. The site boasts many amenities, including a 270° view of the sea. The main inn has been refurbished with modern amenities while retaining its historic charm. We were taken with the place immediately and hope to return someday for a longer visit. Once settled in, we explored the grounds. The first thing that I noticed, which had nothing to do with the resort at all, were thunderheads appearing to the northwest that confirmed the wisdom of our early departure from New Hampshire that morning. The main inn is a charming structure, elegant in its simplicity. The coastal views are lovely and very different from other places we have visited. The Bear wondered if this was wizard's chess. We obtained a key to the Pine Room, a game room on the second floor of what appeared to be a former stable. Inside, we found pool, air hockey, vintage candlepin bowling, foosball, and other tabletop games. We had the room to ourselves. The Bear and I played a raucous game of air hockey, but she lost interest when I won. She had been beating me at several Wii Sports Resort games recently, so I viewed my victory as a minor restoration of balance. We also enjoyed the candlepin bowling alley with its manual ball return. We played in the Pine Room until it was time to depart for our dinner date with Alex. Alex was in many of my classes through junior high and high school and, though we were acquaintances for many years, we did not become closer friends until later in high school. We stayed in contact through the early years of college and saw each other a few times despite attending different universities. Like so many of us do, we drifted apart as our lives took us down different paths. I did not know what became of him until I found him on Facebook many years later. I confess to being surprised that he had made his way as far east as Maine. As I planned the visit, I asked Alex if he could recommend any seaside places to partake of fresh lobster. I wanted to treat Kristy and The Bear to the ultimate "$100 hamburger". In fact, going to Maine for fresh lobster had been a goal of ours for the last two years, but circumstances always seemed to get in the way. Alex recommended his own backyard, volunteering to host us at his home for a lobster bake. This was far better than any restaurant! It was strange to show up at his door and see him again after more than 20 years, but he was immediately recognizable (I cannot say the same for all of my high school friends). Alex and Meg gave us a first class welcome and treated us to a wonderful evening. The Bear and Alex's oldest son entertained themselves playing with Lego. In the back yard, Alex casually pulled seven live lobsters from a paper sack, removed the rubber bands from their claws, and placed them into a large pot to steam. He had been taught to cook lobster by a local lobsterman and knew exactly what he was doing. It was probably the most educational dinner I have ever eaten. The Bear loved her first taste of lobster! Kristy and I had never eaten whole lobsters before, but Alex taught us how to disassemble the beasties, where the best meat was to be found, and what to avoid. Meg had also prepared corn, salt potatoes, and cole slaw - classic lobster bake fare. Dinner and conversation were wonderful and, sadly, the evening ended far too soon. Hopefully, Kristy and I can return the favor by hosting Alex and his family at our home someday. The next morning, we awoke early and enjoyed a great breakfast at the Newagen Seaside Inn. I planned a flight home, filing for a 2:00 departure based on forecasts for severe weather near Syracuse in the early evening. Given my fascination with lighthouses, I had no intention of departing Maine without visiting one. Pemaquid Point Lighthouse was originally commissioned by president John Quincy Adams in 1826. When the original tower was found defective, it was rebuilt in 1835 as the brick and stone structure that still stands today. We learned something new and unfortunate on the road to Bristol, Maine; The Bear can become carsick. To date, she has been immune to motion sickness and, unlike Kristy and I, would often read with impunity while travelling by car. But reading while traversing the roller coaster-like roads of coastal Maine was too much for The Bear and she quickly went from "my stomach feels funny" to moaning in the backseat and exclaiming, "I wish we'd never come to Maine...I wish we'd just gone home after Vermont...I don't want to fly today." The last twenty minutes of the drive to Pemaquid Point were rough. She perked up in the fresh sea air, however. While she was not as taken with the picturesque lighthouse as I, something else grabbed her attention. She was enthralled by the rocky shore. The Bear loves climbing on rocks and the rugged Maine coast was just the antidote to her motion sickness. Before long, she transformed back into her usual, goofy self. "Was this worth the trip after all?" I asked her. "SO worth it!" she cried enthusiastically, racing off to explore more of the shoreline while I lagged behind entreating her to "be Claireful" (we have our own language). We may call her The Bear, but I swear that our child is half mountain goat. ...while I was intrigued by the geology and lines of the place. Kristy, on the other hand, chose to stay on level ground and to watch us scrambling around on the rocks below (that's her up there, the little blue dot with legs between the fog bell and lighthouse). Some of the rock features made for interesting winds. "Look! I have a crown!" exclaimed The Bear as we reviewed these photographs together. There appeared to be a Little Bear in this small cave. I knew we nicknamed her that for a reason. After a half hour of exploring the rocks (not enough time, as far as The Bear was concerned) we got in line for the lighthouse tour. The tower cab is accessed by a spiral staircase terminating at a short ladder. The cab is quite small and dominated by a fourth order Fresnel lens enclosing the lamp. Per the docent, this is the original lens; a fact that he provided in support of his plea that no one touch it. We enjoyed an elevated view of the Atlantic and immediate coastline, then descended the stairs and set off for the Brunswick Executive Airport and home. We launched in marginal VFR conditions and circled south of the field at 3,000 feet while I received our clearance from Portland Approach. 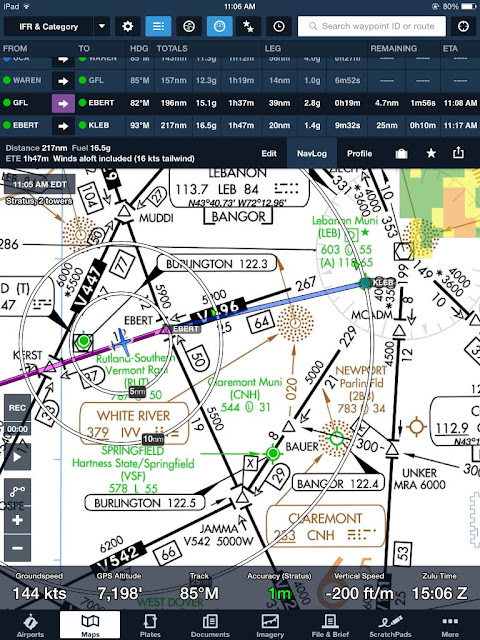 We were cleared for a different route than filed, but the first waypoint was 150 nautical miles to the west in New York State, providing plenty of time to reprogram the flight plan in the Garmin 430W. Kristy is still uncomfortable with flight in IMC, even when the ride is smooth. As we were instructed to climb and maintain 6,000 feet, I wondered how high the cloud tops were relative to our cruise altitude. We took one last look at the gloomy, tattered coast of Maine before ascending into the murk. At 5,000 feet, the dark gray enveloping Warrior 481 gradually transitioned into a brilliant white haze of scattered sunlight. We were approaching the tops. Then there came a flicker of blue that become more pronounced as we rose from the overcast, our wings slicing through the gauzy cloud tops. Leveling at 6,000 feet, we skimmed over a misty sea of the purest white, brilliantly illuminated by the sun. Having spent most of the day beneath the overcast, our eyes struggled to adjust to this new, brighter world. We seemed to fling ourselves from the edge of a stratus cliff, to soar over scattered islands of cumulus. 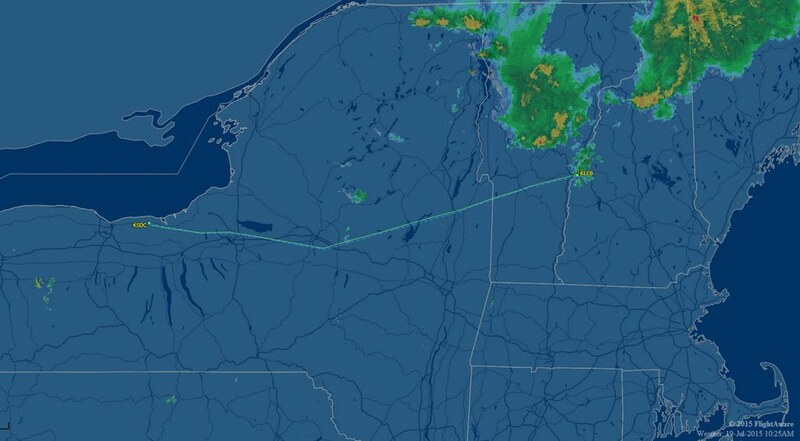 While much of the flight home was in the clear, we nonetheless logged about 1.5 hours of actual IMC time owing to the initial climb to altitude, flying through canyons of cumulus, and a large area of rain and haze near Utica, NY. I decided that flying through the rain was a good way to cleanse the airframe of any salt residue from the sea air. 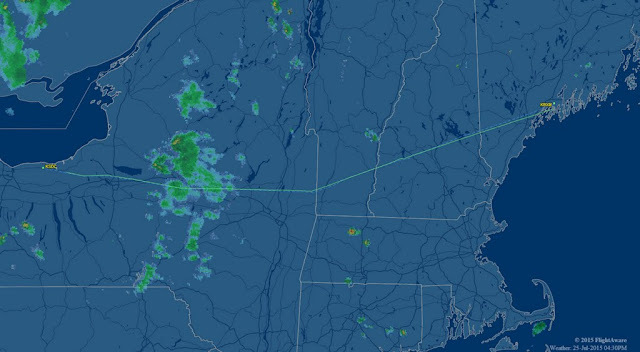 Over the mountains near the New Hampshire / Vermont border, we deviated briefly for an unknown primary radar target detected by Boston Center. We also picked up a strong, but sporadic, emergency locator transmitter on 121.5 and reported it to air traffic control. We heard a later transmission while in contact with Albany suggesting that the ELT may have been a false alarm from a jump plane operating in the region. At times, it seemed as though the clouds parted along our trajectory, allowing us to pass. Our vacation ended, as many of them do, with the familiar runway of the Williamson-Sodus Airport waiting to receive us back to Earth. 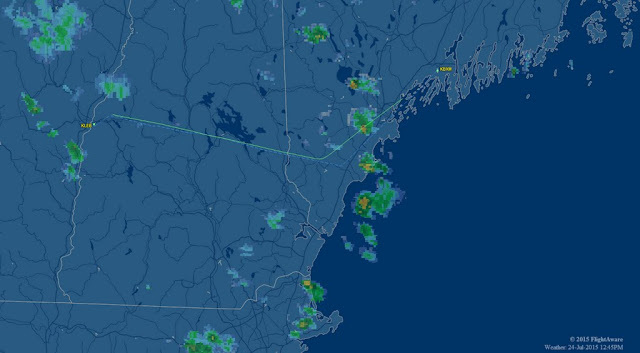 At the end of the journey, we counted two new airports, a new state for Kristy and The Bear (Maine), 1.7 total hours of flight in actual instrument conditions, multiple reunions with family and friends, and many new places explored. Looking cool and ready for departure. At the conclusion of Granny's first flight, we temporarily parted company with Kristy's parents. We intended a rendezvous with them later that day in Lebanon, New Hampshire. My in-laws were driving and we were flying, a clear example of where going the high road will get you anywhere faster, particularly when mountains are involved. Our ultimate destination was the Curtis Hollow Farm in Bridgewater, Vermont where we would gather with the rest of Kristy's immediate relatives for our third annual family vacation. We were all eagerly anticipating the time together. Sometimes, I am amazed by what we can carry in the Warrior. The large black rollerbag is our go-to general aviation suitcase. It just fits through the baggage door and is large enough to carry a week's worth of clothing for me and Kristy. I have come to appreciate the expanded capability afforded by my instrument rating. Though I have rarely flown through serious instrument weather conditions, the mere assurance of being able to relieves a lot of stress. That is not to say that we travel with impunity, but we do travel with greater flexibility. For this trip, I filed an airway route that provided an opportunity to practice tracking VORs while only adding five minutes to the flight time versus a GPS-direct course. We remained in visual conditions for the entire flight despite flirting with occasional cloud decks like this one near Rutland, VT (our IFR alternate airport) . My one concern, as I monitored the weather at our destination, was a small storm loitering just north of Lebanon. As we drew closer to Lebanon, the weather lumbered off to the east. Once within reception range of the Lebanon ATIS broadcast, we verified calm winds and good conditions for a visual approach. Whether it was due to terrain or traffic I cannot say, but Boston Center held us at altitude until we were quite close to Lebanon. Roughly eight miles away from our destination, I pulled the throttle to idle, descended at an aggressive 1,500 feet per minute, and -- while still power off -- joined the pattern on a right base as instructed by the tower and softly rolled onto runway 18. Lebanon Municipal Airport while on short final, runway 18. Photo by Kristy. FlightAware ground track. Route: KSDC WIFFY V2 UCA V496 EBERT KLEB. It was unbelievably hot in New Hampshire; high 80s with Carolina style humidity. Everyone, particularly the locals, remarked upon it. "This just isn't normal," they would say. For us, the discomfort also represented a bit of irony. After the stifling heat of Ocean Isle Beach North Carolina last year, we deliberately chose a location for this year's family gathering expected to possess a more temperate climate. The Bear assisted with unloading our baggage. The eastern sky was darkened by the storm that had worried me while inbound. Our final destination in Bridgewater / Woodstock, Vermont was a 45 minute drive to the west. Upon departing the airport, the first thing that caught our attention was that most ubiquitous of sights to American travelers: a McDonald's. Specifically, it was a sign for the McDonald's lobster roll, complete with an assurance of manufacture from "100% real lobster". Kristy and I exchanged looks of astonishment as we passed this sign. Would any self-respecting New Englander actually go to McDonald's for a lobster roll? Granted, we were a fair distance inland on the New Hampshire / Vermont border, but we also saw these abominations advertised in coastal Maine later in our travels. Our home for the week was this house on the Curtis Hollow Farm. The 100 acre property was originally gifted to John Curtis for service during the Revolutionary War. This large, modern house still incorporates the original 1780 homestead in the form of a single room dominated by a stone fireplace. The room's strong aromas of past fires and old wooden structure led me to suggest that it smelled like Greenfield Village in there. As shadows lengthened across the idyllic property on our first night, we had our greatest moment of excitement. A severe thunderstorm rumbled through, dousing everything with sideways rain. My father-in-law and I literally struggled to batten down the hatches; open roof borne skylights whose closing mechanisms required hand cranks. The cranks were missing. I pulled a "Primitive Pete" and used a pair of left-handed scissors to operate the window mechanism as rain poured through them. Once we made it stop raining indoors, the house lost power and all of the fans combating heat and humidity fell silent. It was not a great start to our vacation and The Bear was positively freaked out by this sequence of events. But, as with the John Cleese character turned into a newt, it got better. Much better, in fact. Power was restored before the adults went to bed that first night and the climate returned to that more typical of Vermont over the course of the week. I will not try to recap the entire vacation here, but some photographic examples are shown below. Quechee Gorge. Photo by Kristy. Over the course of the week, we had great conversation and food, played games, explored the property, hiked, tie dyed t-shirts, visited the Ben & Jerry's factory, discovered a yummy root beer, played tennis (sort of) and miniature golf, and had a genuinely wonderful time. It was yet another beautiful locale brought closer to home through aviation.